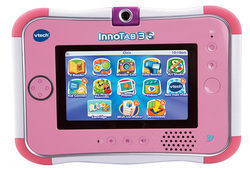 Give your child their own durable multimedia touchscreen tablet with VTech's InnoTab 3S. This multifunctional tablet for children aged 3 to 9 years has been scaled down in size to make it even more portable than before. It features a 5 inch touchscreen, a 2 megapixel rotatable photo/video camera, a rechargeable battery pack, child-friendly WiFi, a G-sensor, 2 GB of onboard memory, a microSD card slot for expandable memory, media players for MP3s, photos, and videos, and a directional-pad. The InnoTab 3S comes complete with the Kid Connect app, plus a bonus game and ebook. 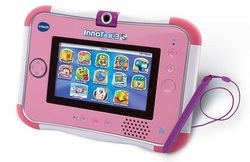 Connect to the VTech Learning Lodge Navigator wirelessly to download TV shows, music, ebooks, and more. Bonus free features include a secure internet browser, the Magic Beanstalk game, and art. The InnoTab 3S has a 2 megapixel 180 degrees rotatable digital camera, so children can capture the action wherever it is happening. Kids can save and edit their photos, and customise them using over 55 special effects and stamps. Videos can also be purchased and downloaded from the Learning Lodge Navigator, and played back on the InnoTab 3S learning app tablet. 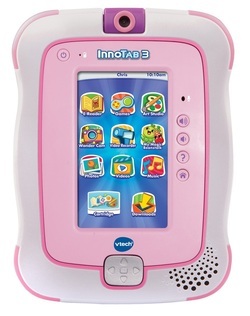 The InnoTab 3S learning app tablet has WiFi connectivity that will allow for easy downloading of ebooks, games, music, and videos from the VTech Learning Lodge Navigator. There is also a kid-friendly internet browser that will allow children to surf the net in a safe environment. The Kid Connect app will allow your child to stay in contact with parents' smartphones and send them text messages over WiFi. 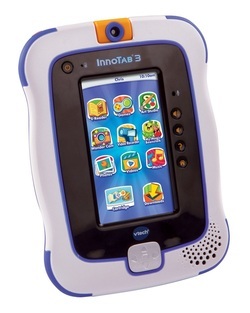 The InnoTab 3S learning app tablet lets your child explore ebooks in an interactive way. Each ebook features story narration, character voices, animation, and vivid graphics to keep new readers engaged. Children can even interact with the characters in their story. Words are highlighted on the screen as your child reads, and they can touch individual words to see how they are pronounced. Each e-book also comes with a story dictionary to help build vocabulary and reading comprehension. The InnoTab 3S comes with the ebook "What's That Noise? ", and there are plenty more ebooks to download via VTech's online Learning Lodge Navigator. With the 5 inch touchscreen and motion sensor, kids can enjoy interactive play with educational games and apps. They can tap, flick, drag, and drop, just as their parents do with their own touchscreen tablet device. The motion sensor lets you turn, tilt, and move the tablet in different directions for additional fun while playing games. The InnoTab 3S also comes with an onscreen popup keypad and a stylus – kids can take notes, draw pictures, create an address book, or use built-in utilities like the calendar and calculator. Each InnoTab 3S can be personalised for different users with different photo wallpapers, user names, avatars, and voice and typed greetings. It even has a kickstand so it can stand up. With the included apps and games, kids can begin to play as soon as they receive their InnoTab 3S. The tablet comes with one motion game, a free download on the Learning Lodge Navigator, touchscreen games, one ebook, art studio and colouring book apps, and several other options for fun and learning. VTech also offers an extensive library of games, ebooks, videos, and songs to purchase via the Learning Lodge Navigator and on individual cartridges. Each game cartridge is packed with activities, and focuses on building reading and logic skills as well as creativity. Games include some of your child's favourite characters. The InnoTab 3S comes with 2 GB of onboard memory and a microSD card slot for memory expansion. Additional content may require a microSD memory card (not included). Rechargeable battery pack and 7.5v adaptor. 12.7cm screen with new landscape format. Optional rechargeable battery pack and 7.5v adaptor. Problem Solving: Develops logic skills and strategic thinking through memory. Language Development: Introduces the alphabet, letter sounds and vocabulary. Basic Maths Skills: Develops counting and number identification. Cognitive Development: Stimulates critical thinking through memory and logic games. Reading Development: Improve speed, fluency and expression when reading. Visualisation and Memory: Engaging graphics & visualisation activities develop memory.